The alarm clock goes off at 3:45am. The silence of the night is almost deafening, and yet the smell of fresh ground coffee rises to our bedroom upstairs. Staggering down the stairs, I carefully calculate all the items I need for the day’s journey, and ensure that I have them staged in the garage ready to be loaded into the car. I quickly down a few pop-tarts and then fill the carafe full of this fresh brewed coffee while Judah loads the car with all our paraphernalia. Once completed, we quickly jump into the car and head to our destination long before the sun comes up. Where are we going? We are going hunting! Contrary to what many may think, every year between November and January 1st, I become a true redneck through and through. If I had my choices, for those two months, I would be happy with a few shotguns and rifles, a couple of God-loving hunting companions, a 4×4 pickup truck and a pack of hunting dogs. After all, it is Whitetail deer season! I was blessed to have a dad and grandfather that took time for me and took me hunting while I was a young child. It has given me such a wonderful appreciation of God’s handiwork, and God has spoken to me many times while in the woods away from telephones, televisions and all the modern conveniences of the day. My experience began by enrolling in the hunter safety course which is now required by law in most states. In this course, you learn all about the importance of safety, and you also understand what happens when you do not follow those safety guidelines. Although there are several topics addressed, perhaps one of the most important is in regard to proper hunting attire: More specifically, the importance of Blaze-Orange. 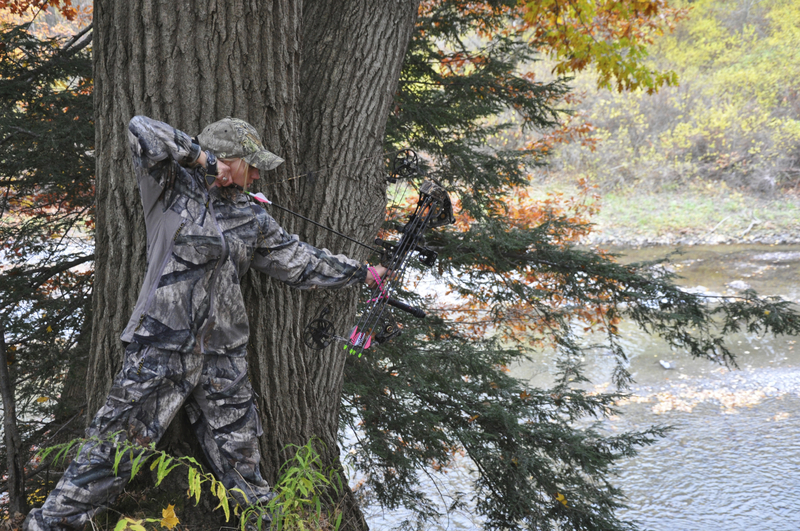 States now require each hunter to wear blaze-orange clothing. This can either be a jacket, or a hat. This was not mandatory when I was growing up, but it was taught by all good and safe hunters like my grandfather and my dad. You see, the situation was that many people were accidentally shot because they were only wearing camouflage and no blaze-orange. Their camouflage was so detailed they blended into the woods too realistically. And because they blended in so well, they were assumed to be a deer or bear by an inexperienced hunter. I qualify that statement by simply stating that an experienced hunter knows to only shoot at a clear target, not one that is hidden in the bush. Camouflage allows you the opportunity to blend into your environment, but the Blaze-Orange causes you to be identifiable to others in the woods. Therefore, it is imperative that you wear this blaze-orange so that other inexperienced hunters do not mistake you for game and shoot you. Today’s church has been so concerned about being relevant in our culture that we have blended in rather than stood out. We have convincing camouflage with all the details. Yet, we have taken off our Blaze-Orange…the thing that sets us apart from the environment that we are contained in. There are billboards here in Charlotte that say, “Our church doesn’t even look like a church”, and other radio spots promoted by “not religion.com”. We force our worship leaders to wear jeans and flip-flops and we choose not to utilize a worship leader who plays keyboards or any other antiquated non-trendy instrument. We require them to play guitar, and we love all the distortion pedals that they can squeeze on to the platform. We look as though we have seasoned and professional musicians that way. We place stipulations on our music department that they can sing no-one else’s music but must write original tunes and only sing those on Sundays. This will ensure that our congregation purchase our CD’s and download our material on iTunes and other .com sites while also ensuring that our community know how cutting-edge our worship department is. May I tell you that this is why our churches are not being successful at winning the lost! We may have much transfer growth, and we may look hip and trendy, but true conversion growth is not taking place as it should be occurring in the churches within the United States. The unchurched are looking for the church, but they are not able to find it because the church looks just like the world. We know that the name of the Lord is a strong tower, the righteous run into it and are safe. The problem is that our tower of hope and refuge cannot be seen because we no longer are identifiable as that strong tower. This is why I believe the Lord gave me the theme for the upcoming Throne Zone Charlotte taken from Joel 2:25: “The Restoration of all things: All things made new”. As I shared last month, I noticed for the first time that the LORD sent the locust and the cankerworm. What do the locust and the cankerworm do? They eat foliage from plants, crops, and trees exposing only the vine or the main trunk of the plant or tree. That scripture goes on to tell us that there are things we need not engage into or participate in so that by your good works, others will glorify God during the day of visitation. As I shared last month, the stripping away from the locust and cankerworm was only a preparation for the coming revival spoken of in verse 28 of Joel 2. The camouflage must come off so that these lost souls can find salvation and deliverance. I find it ironic that here in Charlotte it is the year that the locust have come to town. Headline news reports tell us that the season for these bugs is short lived. Yet, as you drive down the streets you can hear millions of these creatures releasing their sound. The news report says that there are 1 million locust found within each acre lot. I believe that what God is doing in you and me is removing our camouflage so that we can be seen to those who are looking for the peace, safety and forgiveness of sins that only comes from Christ. It is my personal prayer, and my prayer for you, that we will allow God to take away from us those things that hinder us, that hide us, the weights that easily beset us, so that we can run the race with endurance and finish the race God has called us to run. I pray that you say “YES” to HIS call for your life, and know that He who hath begun a good work in you will be faithful to complete it…in YOU! Will the real church please stand out!